Candle Filters work on the basis of pressure. The fluid to be filtered is forced through a series of vertical filters (candles). The solids in the fluid being filtered cakes on the filter candles until flow is decreased and pressure starts building. 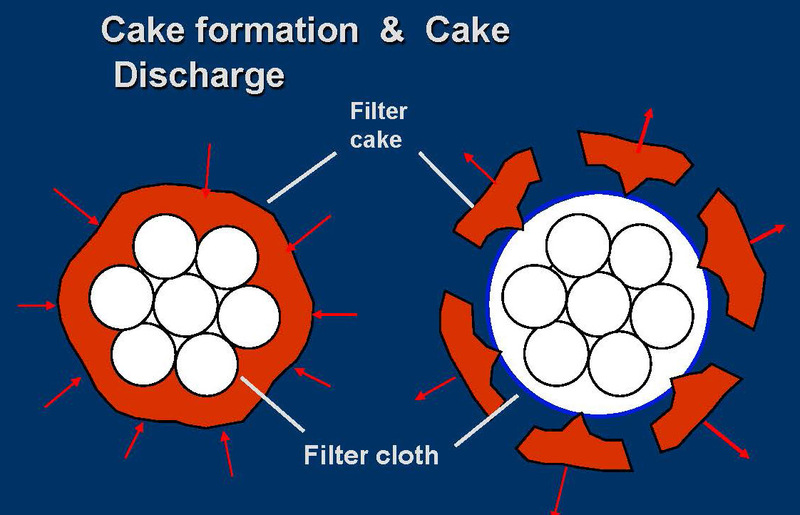 At that point, a pulsed air or nitrogen (gas) in reversed flow, causes a rapid deflection of the filter cloth of the candle and the immediate detachment of the cake, where they drop to the bottom and fall out of the filter. The candles can be made out of a wide variety of materials, depending on the material being filtered. In the Candle Filters, solids are removed from the slurry as the fluid passes through the filter media from outside. So as the cake grows on the outside of the cylindrical Candle filters surface, the surface area also increases. This means that the cake thickness grows more slowly than it would on a flat-faced filter, and results in a more linear change in pressure and flow rate. The filter is constituted by a frame to fix the candle and the connecting pipes. The candle is made by a flange plastic body and equipped with 5 nozzles and a bottom butterfly valve for the discharge of the material. The flow of filtering solution and clean water is controlled and regulated by mean of a membrane pump with dumper and a pneumatic or electric valve-system. The air compressed circuit is equipped with a buffer tank and pressure regulation device. Filtration of sludges/slimes from copper refining, and leaching of the copper, silver, E-Waste, etc.